Check out our Halloween theatre roundup, featuring all the fairies, demons, and puppets you can handle. 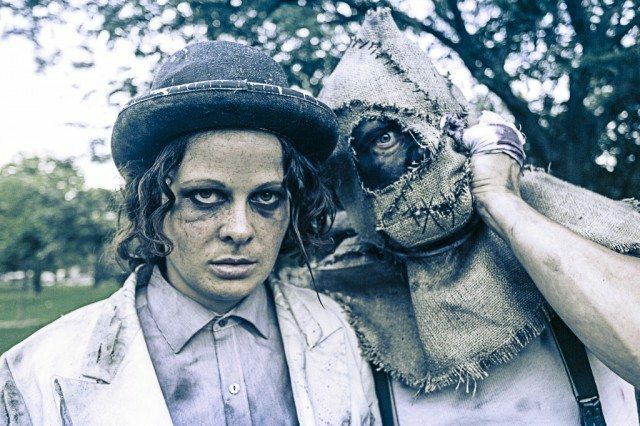 Claire Armstrong and Tim Walker are fay folk in The Skriker. Photo by Zaiden. It’s hard to tell what’s scarier in this production of a notoriously difficult-to-produce script by brilliant but troubled playwright Caryl Churchill: is it the insidious way the titular “Skrikers” infiltrate the lives of two young mothers (played by Perrie Olthius and Suzette McCanny)? Or is it the disconnect between the corrupted fairy folks’ sincere attempts to love and to understand human obsessions? The mysterious Skriker manifests as 10 different characters (played by 10 different actors) over the course of the show. The first manifestation is the narrator, played by Claire Armstrong, who performs the play’s fiendishly difficult opening monologue in a nonsense language not unlike Cockney rhyming slang. Her deft and sympathetic performance sets the tone for the rest of the show. The Skriker marks Danny Pagett’s directorial debut, and he’s supported by an exceptional collective cast and original music by Andy Trithardt in a performance that hits all the right notes. Kimwun Perehinec, “Frye,” and Eric Woolfe in Frankenstein’s Boy. Photo by Dawn Weaver. Eldritch Theatre always has a theatrical offering this time of year—usually a Doc Wuthergloom show featuring writer and performer Eric Woolfe’s ancient necromancer/salesman character and a cast of ghoulish puppets. But this year, Woolfe has written a new show starring himself and Kimwun Perehinec as human companions to Frye, a new character in the Eldritch puppet stable with ties to one of horror’s most iconic characters. Tickets are limited for this “blood-drenched, dieselpunk, gothic romance with puppets, people, and dark parlour magic,” so best to get pulling those strings now (that is, buying tickets online). There’s no modern stage show more closely associated with Halloween than The Rocky Horror Show, the campy film adaptation of which has developed a huge cult following. Unlike, say, the stage adaptation of Dracula, it’s aged well. The Lower Ossington Theatre has produced Rocky Horror for seven straight years; this year, with a full slate of mainstage shows, they’ve turned it into an interactive cabaret in the downstairs space, so you can get up close and personal with the performers (not too close, though, because when in character the performers are liable to bite—especially Frank n’ Furter). 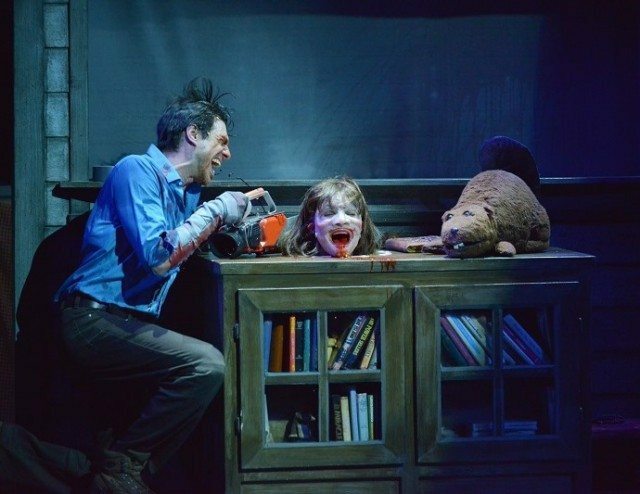 David Sajewich takes a chainsaw to a Candarian demon in Evil Dead the Musical. Photo by David Coombs. Rocky Horror may lay claim to being the musical best associated with Halloween worldwide, but here in Toronto, we have a homegrown show that’s just as popular. Evil Dead: The Musical is back for a limited run that kicks off on Halloween night, following an extensive 2014 North American tour. The road-tested cast will no doubt be psyched to sing already classic songs such as “All the Men in My Life Turn Out to Be Candarian Demons” in the city where it all started. And if you’re a longtime fan, don’t fret—the splatter zone is back.